Arranged and translated by Rabbi Mordecai Kaplan, the Sabbath Prayer Book is the first Reconstructionist prayerbook we know of to have entered the Public Domain. (The prayerbook entered the Public Domain due to lack of copyright renewal by the copyright owner listed in the copyright notice, the Jewish Reconstructionist Foundation, as evidenced in the Stanford Copyright Renewal database.) . . . Arranged and translated by Rabbi Ben-Zion Bokser, Ha-Maḥzor (1959) and Ha-Siddur (1957), are the most recent modern prayerbooks to have entered the Public Domain. 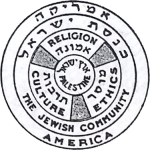 (Both Ha-Siddur and Ha-Maḥzor entered the Public Domain due to lack of copyright renewal by the copyright owner listed in the copyright notice, the Hebrew Publishing Company.) Making digital images of . . . This is a faithful transcription of a prayer appearing at the end of a sermon delivered by Rabbi Abraham de Sola in K.K. Shearith Yisrael (Montreal), “during the prevalence of asiatic cholera,” and subsequently published in the Occident and American Jewish Advocate (7:7, Tishrei 5610/October 1849). The English translation is a “free translation” made by Rabbi Abraham de Sola. . . .
To the best of my ability, this is a faithful transcription of a teḥinah (supplicatory prayer) composed in parallel to the Shir Shel Yom (Psalm of the Day) for Wednesday, following in the paraliturgical tradition of Yiddish tkhines, albeit written in French. (This particular paraliturgical prayer may be original or it may be based on an earlier work in German or Yiddish. Please contact us or comment below if you can identify it.) The prayer was included by Rabbi Arnaud Aron and Jonas Ennery in their opus, אמרי לב Prières d’un Coeur Israelite published in 1848 by the Société Consistoriale de Bons Livres. In 1855, an abridged English translation of Prières d’un Coeur Israelite was authorized by Nathan Marcus Adler, chief rabbi of the British Empire and published as Prayers and Meditations, translated by Hester Rothschild. In 1863, Isaac Leeser published his own translation. This is the first time that Leeser’s translation and its source have been set next to each other. . . .
To the best of my ability, this is a faithful transcription of a teḥinah (supplicatory prayer) composed in parallel to the Shir Shel Yom (Psalm of the Day) for Tuesday, following in the paraliturgical tradition of Yiddish tkhines, albeit written in French. (This particular paraliturgical prayer may be original or it may be based on an earlier work in German or Yiddish. Please contact us or comment below if you can identify it.) The prayer was included by Rabbi Arnaud Aron and Jonas Ennery in their opus, אמרי לב Prières d’un Coeur Israelite published in 1848 by the Société Consistoriale de Bons Livres. In 1855, an abridged English translation of Prières d’un Coeur Israelite was authorized by Nathan Marcus Adler, chief rabbi of the British Empire and published as Prayers and Meditations, translated by Hester Rothschild. In 1863, Isaac Leeser published his own translation. This is the first time that Leeser’s translation and its source have been set next to each other. . . . This is a faithful transcription of a teḥinah (supplicatory prayer) composed in parallel to the prayer for Monday, following in the paraliturgical tradition of Yiddish tkhines, albeit written in French. (This particular paraliturgical prayer may be original or it may be based on an earlier work in German or Yiddish. Please contact us or comment below if you can identify it.) The prayer was included by Rabbi Arnaud Aron and Jonas Ennery in their opus, אמרי לב Prières d’un Coeur Israelite published in 1848 by the Société Consistoriale de Bons Livres. In 1855, an abridged English translation of Prières d’un Coeur Israelite was authorized by Nathan Marcus Adler, chief rabbi of the British Empire and published as Prayers and Meditations, translated by Hester Rothschild. In 1863, Isaac Leeser published his own translation. This is the first time that Leeser’s translation and its source have been set next to each other. . . . This is a faithful transcription of a teḥinah (supplicatory prayer) composed in parallel to the prayer for Sunday, following in the paraliturgical tradition of Yiddish tkhines, albeit written in French. (This particular paraliturgical prayer may be original or it may be based on an earlier work in German or Yiddish. Please contact us or comment below if you can identify it.) The prayer was included by Rabbi Arnaud Aron and Jonas Ennery in their opus, אמרי לב Prières d’un Coeur Israelite published in 1848 by the Société Consistoriale de Bons Livres. In 1855, an abridged English translation of Prières d’un Coeur Israelite was authorized by Nathan Marcus Adler, chief rabbi of the British Empire and published as Prayers and Meditations, translated by Hester Rothschild. In 1863, Isaac Leeser published his own translation. This is the first time that Leeser’s translation and its source have been set next to each other. Commenting on Rothschild’s translation, Leeser wrote: . . . The siddur, Aḅodath Yisrael was first prepared for Temple Oheb Shalom (Baltimore, Maryland) by Rabbi Benjamin Szold (1829-1902). Before Szold’s arrival in 1859, the congregation had adopted for use in its Shabbat service the Minhag America by the Reform rabbi, Isaac Meyer Wise. After much discussion with his congregation Szold introduced Aḅodath Yisrael, which hewed more closely to traditional Ashkenazi custom. The first edition of this prayer-book appeared in 1863 with German translation, and was widely adopted by congregations in the United States. New editions were published in 1864 and 1865 (the latter with English translation), and another, revised edition in 1871, by Rabbis Marcus Jastrow of Philadelphia (1829-1903) and Henry Hochheimer of Baltimore (1818-1912). . . .
Siddur Tefilot Yisrael (Sabbath & Festival Prayer Book), based upon a manuscript of Rabbi Morris Silverman, was widely used in Conservative synagogues until the late 1980s and remains a favorite prayerbook for many who grew up using it. First published by the Rabbinical Assembly and United Synagogue of America under their copyright, this siddur is . . . This manual has been devised for the express purpose of giving the Rabbi, or anyone officiating at a Jewish ceremonial or ritual, a concise and practical aid that will facilitate the task of officiating , and will obviate the necessity of resorting to the voluminous literature pertaining thereto. . . .
Ha-Siddur Ha-Shalem (The [Complete] Daily Prayer Book), translated and arranged by Paltiel Birnbaum, was widely used in Orthodox and Conservative synagogues until the late 1980s and remains a favorite prayerbook for many who grew up using it. First published by the Hebrew Publishing Company in 1949 under their copyright, this siddur is in the Public . . .
Geshem and tal: rain and dew. We pray for each in its season, geshem all winter and tal as summer approaches…not everywhere, necessarily, but in the land of Israel where our prayers have their roots. In a desert climate, water is clearly a gift from God. It’s easy for us to forget that, here with all of this rain and snow. But our liturgy reminds us. Through the winter months, during our daily amidah we’ve prayed “mashiv ha-ruach u-morid ha-gashem” — You cause the winds to blow and the rains to fall! We only pray for rain during the rainy season, because it is frustrating both to us and to God when we pray for impossibilities. . . . This prayer-leaflet was primarily intended for a group of Hebrew Union College students who met every sabbath afternoon for extra-curricular (noncredit) Torah study with Dr. Rabbi Jakob Petuchowki in the mid-1960s. Their service was conducted entirely in Hebrew and in the traditional nusaḥ with some minor but interesting Liberal innovations. Petuchowki writes, “We have omitted only the various repetitions as well as the prayer for the restoration of the sacrificial service. (But we have retained the place of Zion as the symbol of the messianic hope.) In the ‘Alenu prayer, we have preferred a positive formulation of the “Election of Israel” to the traditional negative one.” . . .